NEWARK — If kids can enjoy bedtime stories, why not bedtime math problems? 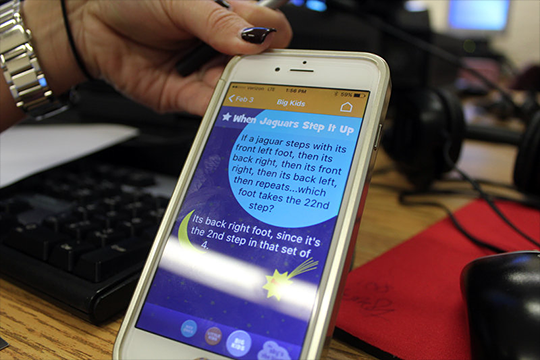 This bold concept was turned into an iPhone application two years ago by trained-astrophysicist-and-mom Laura Overdeck — and now, the state's largest public school district and Overdeck are partnering to promote the app. Called "Bedtime Math," the app, ironically, promises to be "nothing like school." It is one way Newark public schools are taking on the achievement gap between high-income and low-income schools, and the general confusion many students across the state have with math, officials said. "I always loved numbers as a kid. I used to look at patterns," Overdeck told NJ Advance Media on Thursday. "This is the first time we're partnering with a school district, because we're pushing recreational math... We're just so excited that teachers are taking the time to let parents know, 'hey, do this fun stuff at home.' It's not the pedagogy. It's playful." Six Newark pilot elementary schools are now encouraging parents of children in grades K-2 to voluntarily download and use the free app with their children for five minutes before bedtime a couple times a week, officials said. Eventually, they will survey parents for feedback, officials noted. The privately funded app is "fun" partly because it has "no scores" and "no stress," and includes a search function that allows kids to look up whatever subjects interest them, said Overdeck, who grew up in Westfield. There are math questions about ninjas, chocolate chips, and "every weird animal," like flamingos and anteaters, she added. Newark educators first started encouraging parents at the six schools to use the app for fun in the fall, and they are now expanding the push to grades 3-5, officials said. The app's at-home use will likely be encouraged in all 40 Newark elementary schools by next fall, said the district's Special Assistant of Math PreK-5 supervisor Darlene DeVries. The voluntary nature of the program — which parents are encouraged to try by teachers during parent teacher conferences and via other school communications — is key, so the app is not being assigned as "homework," said DeVries, who said that Overdeck had reached out to Newark. "This is just another resource for the parents to use, outside of the core (classroom) resources," DeVries said. "It's kind of actually a bonding experience for the parent and the child." Overdeck, a Princeton University graduate whose new company is based in Summit, majored in astrophysics with the intent to become an astronaut before going into the private sector. She creates the math problems herself, she said, and has been doing so since she started giving fun nighttime math problems to her own children 10 years ago. Though Newark has yet to survey parents, Overdeck's app has already received positive research results: The University of Chicago researched the app with a group of nearly 600 first-graders and their parents, and found the kids outperformed a control group by almost "three months in math achievement." On Thursday, Overdeck explained the app's usefulness to a handful of parents during a 1 p.m. workshop in Ridge Street School, one of the six pilot schools. Ridge Street School Principal David DeOliveira, a former math teacher, said teachers have told administrators "that the kids really enjoy it." Aida Irizarry, who was among the few parents at Thursday's workshop, said she thought the app was a "great idea" and it had already helped her daughter with fractions. "She went on the website, she figured it out," she said. Catherine Greer, the school's PTO president, asked Overdeck whether the app aligned with how her son is taught math in school now. "'Bar modeling.' That was the (homework) question he asked me last night. No clue," Greer said, as other parents laughed knowingly. Overdeck said the app did not prescribe any method to get to an answer. "When kids are (math) fluent, you eventually find it doesn't matter what the method is," she said.